TL;DR: Symfony is a PHP framework, made up of a lot of decoupled and reusable components. It's a framework that promotes standardization and professionalism, supports best practices and interoperability of applications. In this tutorial, I'll show you how easy it is to build a web application with Symfony and add authentication to it without banging your head on a wall! Check out the repo to get the code. Symfony Framework has a vibrant community just like its counterpart - Laravel. The ecosystem around Symfony Framework thrives from the utmost significance of the plethora of reusable PHP components that Symfony provides. These components are used throughout PHP land. Tools like WordPress, Drupal, phpBB and Laravel depend on Symfony Framework components a lot. Well-known PHP projects such as Silex, Twig and Swiftmailer originated from Symfony projects. One notable Symfony community is Sensiolabs Connect, which is an extensive professional network for Symfony developers. Yaml - Loads and dumps YAML files. Symfony Framework allows a developer to create plugins called Bundles. Everything is a bundle in Symfony, including both the core framework functionality and the code written for your application. This gives a developer the flexibility to use pre-built features packaged in third-party bundles or to distribute your own bundles. Read more about Symfony Bundles. 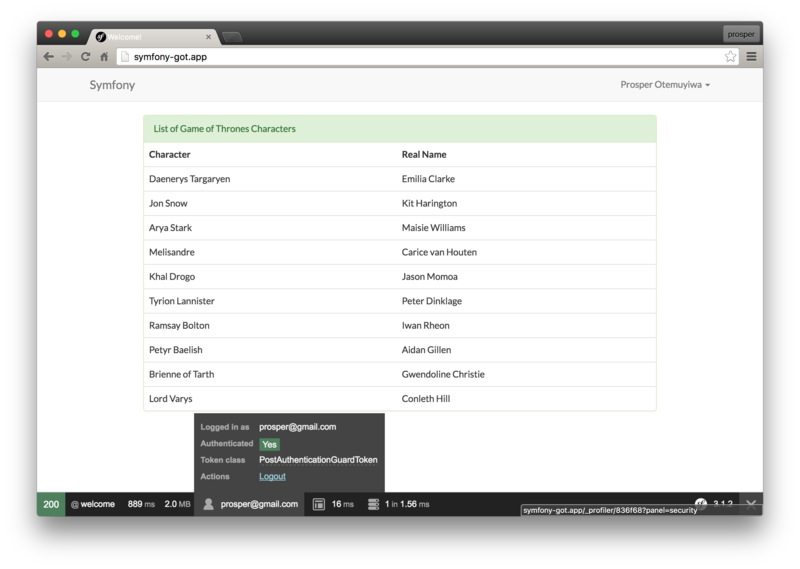 We'll be building a simple character listing app with Symfony 3.4 like we did with Laravel here. 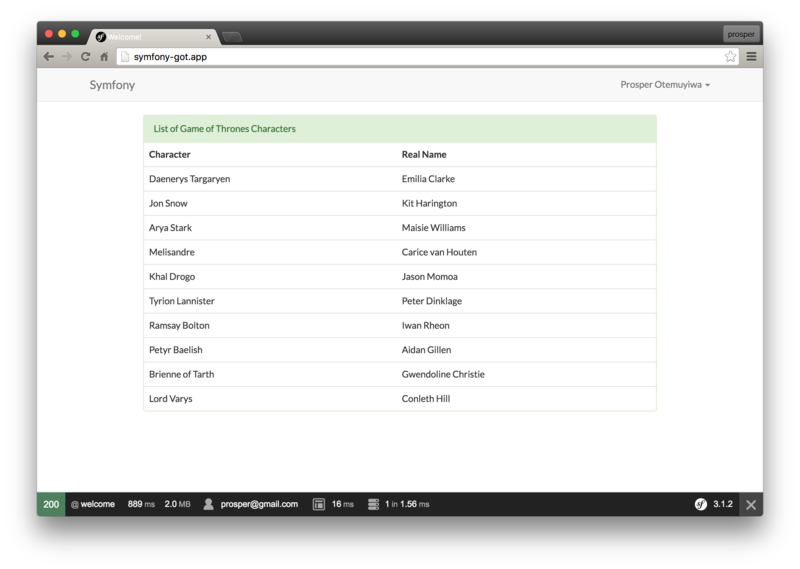 Our app will simply list 10 Game of Thrones characters and their real names. Once we add authentication to the app, all logged-in users will have the privilege of knowing these celebrity characters personally. Symfony utilizes Composer to manage its dependencies. So, before using Symfony, make sure you have Composer installed on your machine. We can install Symfony Framework by issuing the composer create-project command in your terminal like so: composer create-project symfony/framework-standard-edition GOT "3.4. *" or using the symfony installer. There are several Symfony distributions available, such as Symfony Rest Edition, Hello World Edition and CMF Standard Edition. A developer is at liberty to choose any to get started with. It's faster to spin up a new app using the symfony command like so: symfony new GOT . Check out the Symfony docs to learn how to set up the Symfony installer. Open up the src/AppBundle/Controller directory and delete the DefaultController.php file. We are going to create new controller files, so we don't actually need the DefaultController. Now, go ahead and create ListController.php, RegistrationController.php and SecurityController.php files inside the directory. $this->render('default/index.html.twig', array('character' => $characters)) indicates that we are passing the $characters array to a view called index.html.twig in a default directory. We'll create that view in the later part of this post. Here, we mapped this controller to the register route. The registerAction processes the user registration form and persists to database; if the form has not been submitted yet, it renders the form created from Symfony FormBuilder. Next, let's create the FormBuilder. 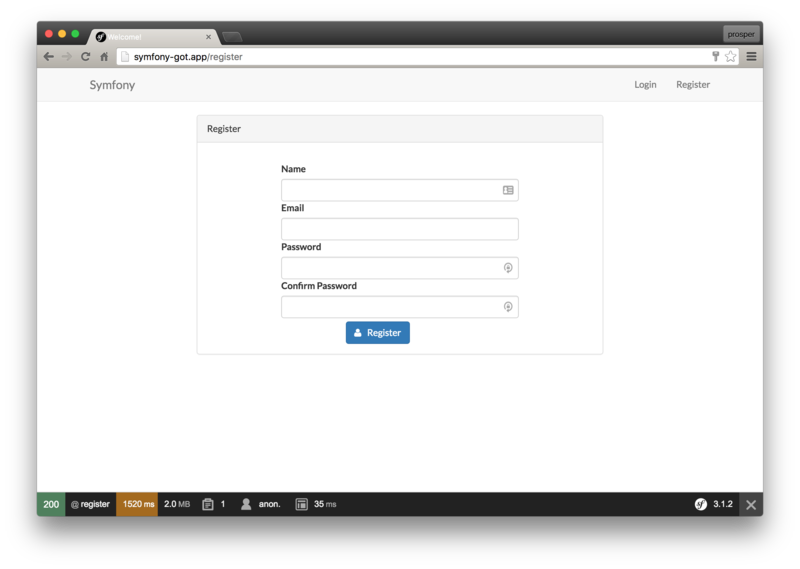 Symfony ships with a Form builder that helps us with generation of forms in our applications. Read more about Symfony Forms. This controller above actually takes care of our login process. Once the /login route is hit, the loginAction renders the login template, then the login_check route will be hit once a user clicks the login button. A user will be logged out once the logout route has been hit. Symfony Framework is configured in a way that you can use any ORM (Object Relational Mapping) of your choice. The Symfony full-stack Framework doesn't integrate any ORM by default; the Symfony Standard Edition, which is the most widely used distribution, comes integrated with Doctrine. The Doctrine ORM lets you map objects to a relational database. Before we set up our model entity, let's configure our database connection. The default driver Symfony ships with is MySQL. You can also just use Laravel Homestead to set up your app. With that, you don't have to run the doctrine:database:create command since vagrant would have created the database during provisioning. Symfony Framework allows several options for setting up routes. It supports annotations and the option of explicitly stating it in app/config/routing.yml. The goal of the Symfony routing system is to parse any URL and determine which controller should be executed. In this tutorial, we'll make use of annotations within our Controllers. I just added the @Route annotation. Once a request hits the / route, it invokes the showAction method of the ListController and renders the returned value in the index twig view. We'll configure the twig view later in this post. 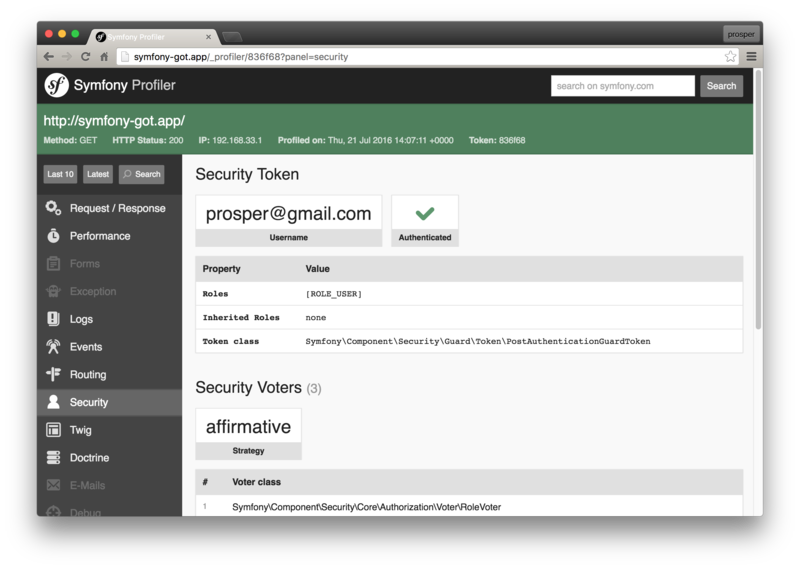 Symfony 3 ships with an awesome security component called Guard that simplifies authentication process. Let's take advantage of it in our app. The first step is to configure the Symfony security settings. These settings configure Symfony to use bcrypt to hash passwords, email field when looking up users and the Symfony Guard authenticator that we will create in a bit. Create a new folder Security inside the src/AppBundle directory. Now, go ahead and create our custom Guard Authenticator FormLoginAuthenticator.php inside the Security directory. The getCredentials() fetches the email address and password from the request, getUser() uses that to load the user and then checkCredentials() checks if the password matches the user account that getUser() fetched. If it matches and the user exists, then onAuthenticationSuccess() is called, otherwise onAuthenticationFailure() is called. The getLoginUrl() and getDefaultSuccessRedirectUrl() must be implemented since we are inheriting the GuardAuthenticator. These methods return the login URL and the URL that a successful login should redirect to respectively.The remember_me functionality is not needed in this app, so we return false in supportsRememberMe(). 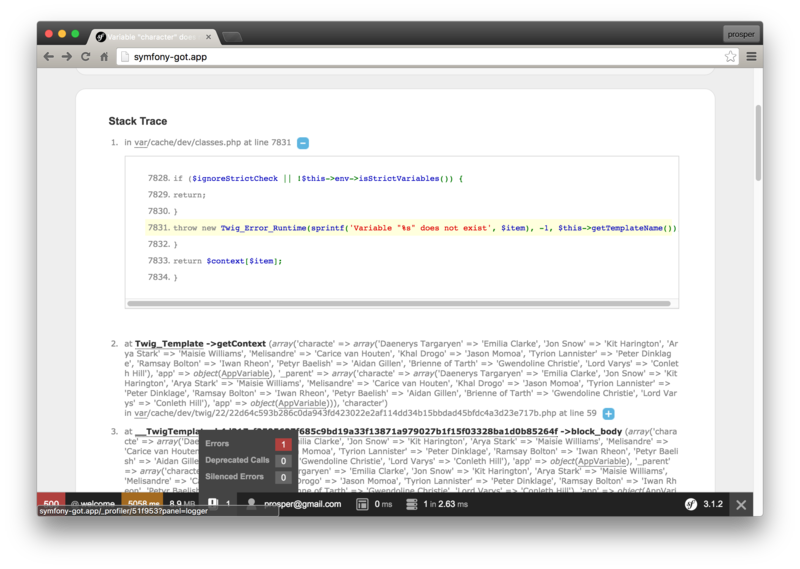 Symfony Framework ships with a powerful templating engine called Twig. Twig allows you to write concise, readable templates that are more friendly to web designers and, in several ways, more powerful than PHP templates. The views needed for authentication in this app are in the app/Resources/views/auth directory. The base layout for our application has also been configured in the app/Resources/views/base.html.twig. All of these views use the Bootstrap CSS framework, but you are free to customize them however you wish. Here, we are looping through the $characters array data passed from the ListController for appropriate rendering in the index.html.twig view. app.user == null - You can check if a user is authenticated or not. It returns true if a user is logged-in and null if a user is not. We are making use of the Symfony built-in form methods in this template. 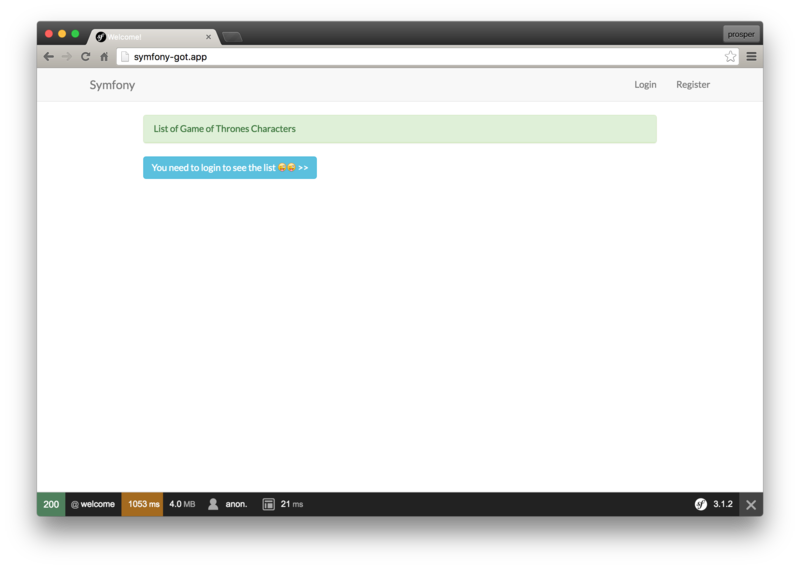 Symfony ships with an awesome web debug toolbar. It is one of the most recognizable elements of Symfony applications. It provides all sorts of information about sessions, cookies, variables, load time, service providers, request-response time cycle, app size and also an extensive error log. This toolbar actually increases the productivity of Symfony developers because it makes debugging super easy! Right now, Laravel is the most trending PHP framework in the world. Laravel thrives on excellent and straightforward documentation. It's also easier to learn. Symfony, on the other hand, is a very stable and mature framework. It's great for very large web projects. Symfony has been around for so long that several PHP projects and frameworks like Laravel depend on many of its components. Symfony forces you as a developer to learn Solid OOP. Many open-source projects build on Symfony components, thus allowing a developer who is well-versed in Symfony to easily work on other PHP projects. CakePHP has an awesome inbuilt ORM that makes building queries and relationships a piece of cake. If you want an excellent comparison of Symfony and other PHP frameworks, check here. 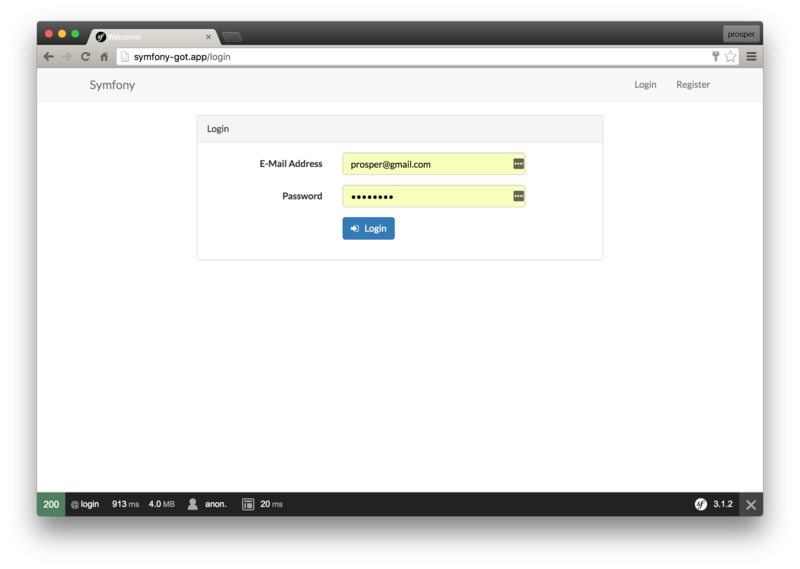 We can easily set up authentication in our Symfony apps with Auth0's Centralized Login Page. If you don't already have an Auth0 account, sign up for one now. 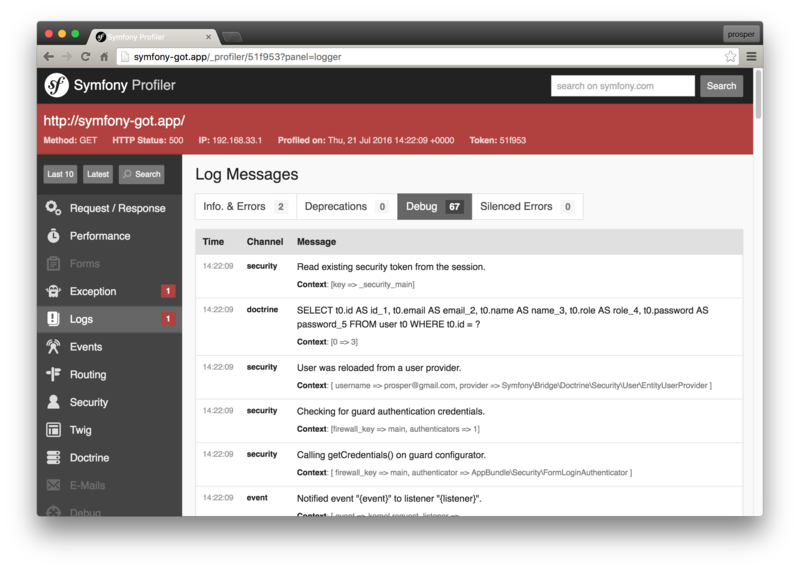 Navigate to the Auth0 management dashboard, select Applications from the navigational menu, then select the app you want to connect with Symfony. Follow the instructions here to configure the Auth0 plugin. Head over to your Auth0 dashboard and register Allowed Callback URLs http://127.0.0.1:8000/auth0/callback and Allowed Logout URLs http://127.0.0.1:8000/auth0/logout. When the login button is clicked, users are redirected to Auth0's Centralized Login Page. We're adding the logout URL from the secured_area firewall as the logout link. Once a user registers, it stores the user information in your Auth0 dashboard. We can retrieve this info using the HWI\Bundle\OAuthBundle\Security\Core\User\OAuthUserProvider class methods. 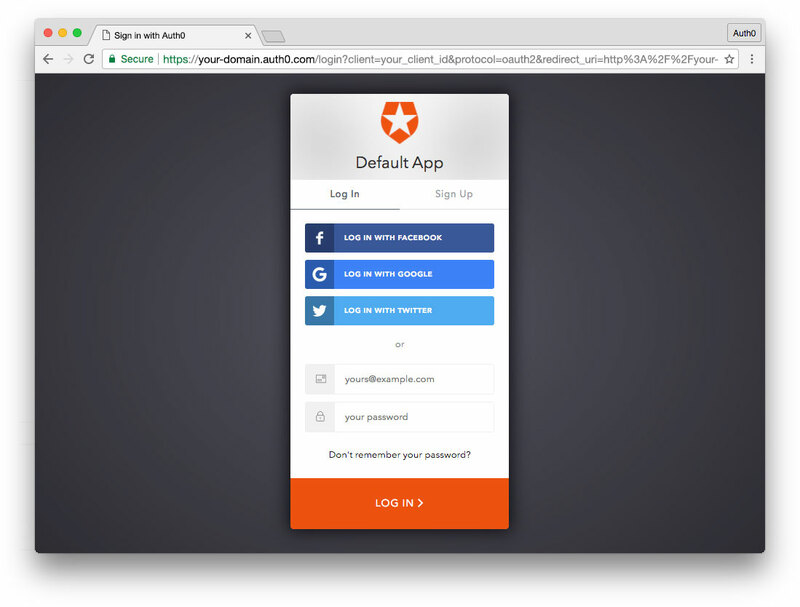 With Auth0, you can have all your users' information stored without having to run your own database. Auth0 provides powerful analytics about users signing up on your platform such as the browser the user logged in with, the location, device, number of logins and more, out of the box! "Symfony is one of the few frameworks out there with certifications for developers."